Rubik's Cube Font Generator | OhGizmo! How About A $460 Yo-Yo? By Andrew Liszewski on 05/21/09 • Leave a comment! 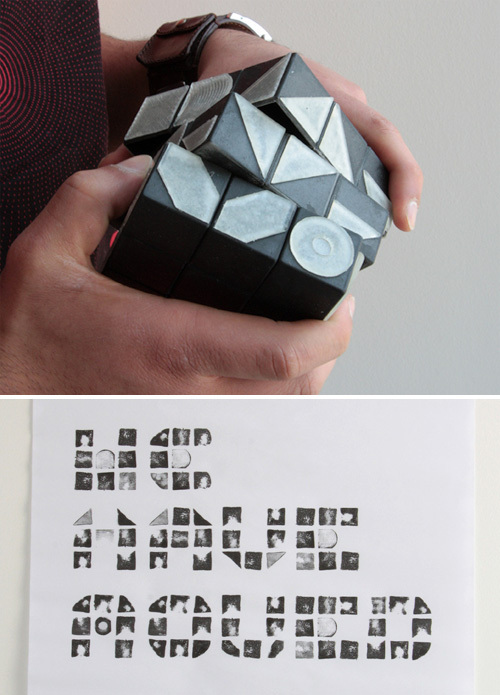 Here’s another interesting take on the Rubik’s Cube which turns it from a puzzle into a graphic design tool. It was designed by Jas Bhachu as part of a project at the Liverpool School of Art & Design where students were challenged to produce a visual representation of the word ‘move’. So instead of colored squares, the Rubik’s Font Generator features a set of stamps on 4 sides of the cube allowing the user to create their own basic pixel font by re-arranging the shapes.